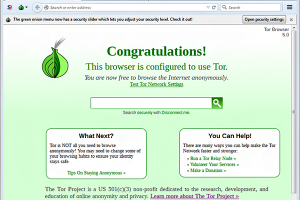 "Use a global network without control to stay anonymous online"
As you reached this page and are reading this article, you probably are concerned about your online privacy and security, as here we present a dedicated anonymity solution called Tor. You might have read the news, heard it on the radio, seen it on television, everything you do online can be monitored. In some countries that is more obvious than others, but a fact is, technology nowadays permits storing all your online data exchanges for mining and other purposes. So, if you would like some anonymity in the age of big data, you might appreciate Tor. Basically, it will prevent anyone from finding out your real location and your browsing habits. It is suitable not only for web browsers, but also for remote logins, instant messaging clients, and other applications connecting over the internet. If interested in finding out more about the free solution presented here, consider proceeding to the download.